Fairlawn's Drew Maddy turns around with the ball as Lehman Catholic's Bryce Kennedy heads for home during a nonconference game on Thursday in Sidney. Lehman Catholic's Ethan Potts throws a pitch during a nonconference game on Thursday in Sidney. Lehman Catholic's Jared Magoteaux watches Fairlawn's Ashton Piper attempt a diving catch in-between second and third base during a nonconference game on Thursday in Sidney. Lehman Catholic’s Bryce Kennedy watches a hit go by on his way to third base during a nonconference game on Thursday in Sidney. Fairlawn’s 21 Lehman Catholic’s Drew Barhorst tags out Fairlawn’s Skyler Piper at second base during a nonconference game on Thursday in Sidney. Lehman Catholic’s Drew Barhorst tries to get ball control as Fairlawn’s Dominic Davis slides safely into second base during a nonconference game on Thursday in Sidney. 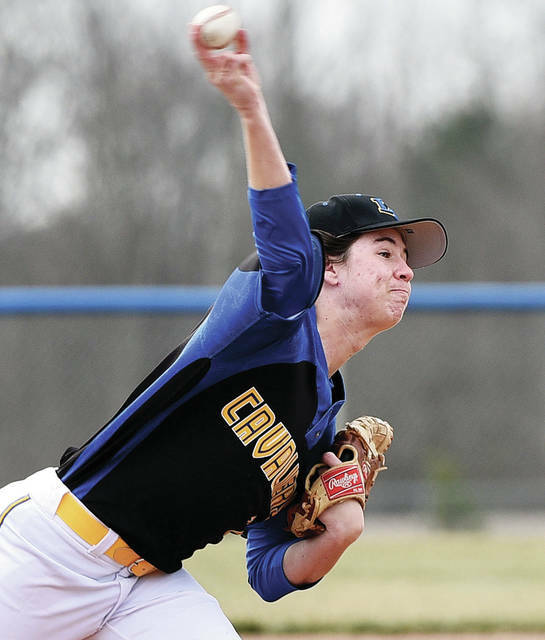 See more photos from Lehman Catholic at Fairlawn baseball here. 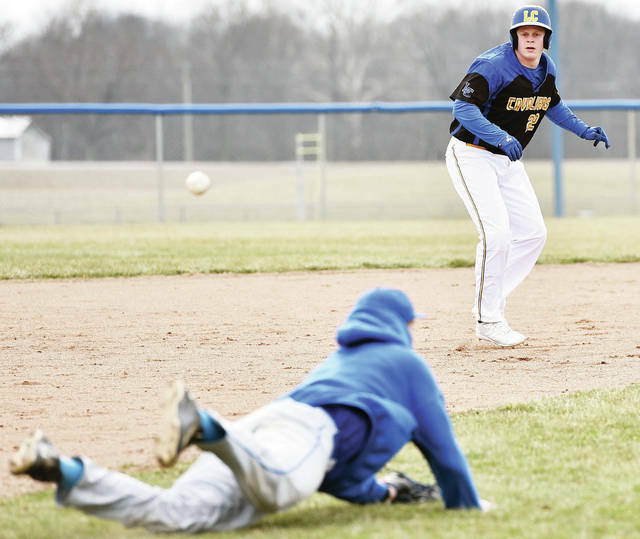 SIDNEY — Longtime Lehman Catholic baseball coach Dave King was concerned with the team’s makeup after a meltdown in the fifth inning of a Northwest Central Conference game against Marion Elgin on Tuesday. The Cavaliers have quickly eased his concerns. 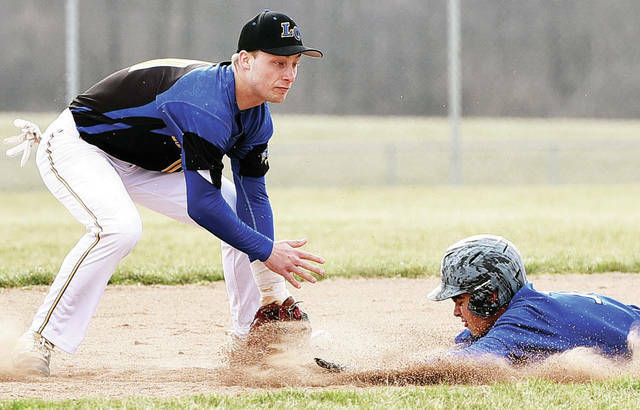 After bouncing back with a four-run win over Miami East on Wednesday, Lehman followed with a 13-1 win at Fairlawn in five innings on Thursday. 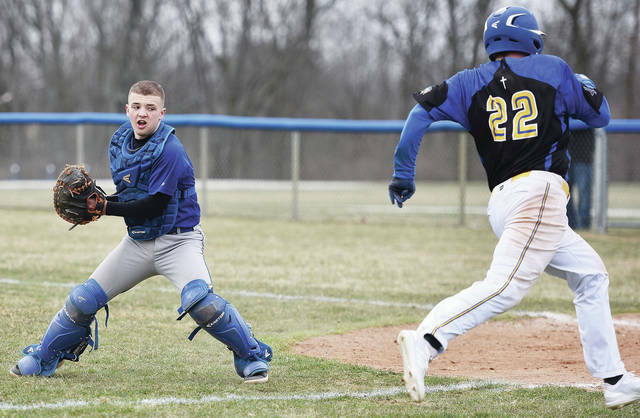 There was a strong wind blowing into the field from behind home plate on Thursday, and Cavaliers took advantage by blasting 19 hits in five innings against Fairlawn freshman pitcher Gage Sharrock. They scored five runs in the first inning and cruised from there. The Cavaliers fell apart in the fifth inning against defending NWCC champ Elgin on Tuesday. The Comets scored seven runs in the inning to seal a 13-2 run-rule win. 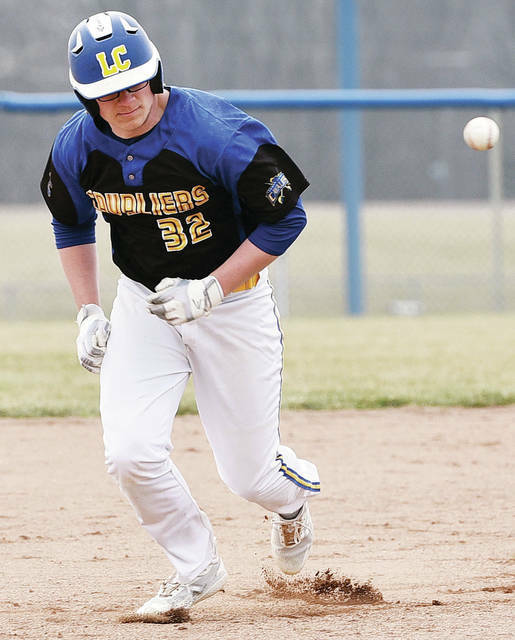 Lehman (5-1, 1-1 NWCC) committed five errors on Tuesday and had several in an 8-4 win over Miami East, too. But the team had just one error on Thursday, which came in the first inning when sophomore shortstop Alex Keller overthrew first base on a single. The Jets scored their only run on the play. King said he was happy to see the squad play clean defensively the rest of the way. Lehman pitcher Ethan Potts gave up two hits in the first inning, including a double by Fairlawn sophomore Skyler Piper, who scored on the error. But Potts allowed only one hit and one walk in the last four innings and struck out six batters. Lessing said Potts’ curveball proved especially difficult for Fairlawn’s batters and said his changeup and fastball worked well. “I like the way he threw in not the greatest conditions with wind all over the place, but our defense played well behind him,” King said. “… He keeps getting better all the time. He keeps you off balance. Fairlawn (3-4) had won its previous two games, including a 12-1 win over New Knoxville on Tuesday in which the squad didn’t allow a hit. Lessing said he’s been pleased with the young team’s progress. The Jets have two seniors and one junior, and the rest of the 16-man roster is made of sophomores and freshmen. “These kids are great to work with,” Lessing said. “These mistakes are going to happen, but they’ll learn from it and get better. Neither team scored in the second inning, and Lehman added one run in the third to take a 6-1 lead. They scored four runs on five hits and a walk in the fourth, then scored three runs on four hits in the fifth to push the margin over 10 runs. Lehman leadoff hitter Drew Barhorst was 3 for 4 with 2 RBIs. Bryce Kennedy was 2 for 4, with both hits being RBI doubles in the first and third innings. Keller was 2 for 4 and scored two runs, while Jared Magoteaux was 3 for 4 and scored three runs. Mitchell Sollman was 3 for 3, including an RBI single in the fourth and an RBI double in the fifth that came on a hard ground ball along the left-field line. Ethan Potts was 2 for 3 with 3 RBIs and Bradly Haynes was 2 for 3. Piper was 2 for 2 for Fairlawn. The Jets’ next game is on Friday at home against Franklin-Monroe. Lehman’s next game is Saturday at Covington. Fairlawn’s Drew Maddy turns around with the ball as Lehman Catholic’s Bryce Kennedy heads for home during a nonconference game on Thursday in Sidney. Lehman Catholic’s Ethan Potts throws a pitch during a nonconference game on Thursday in Sidney. Lehman Catholic’s Jared Magoteaux watches Fairlawn’s Ashton Piper attempt a diving catch in-between second and third base during a nonconference game on Thursday in Sidney.